These past two weeks, I’ve had the honor of reading at two community colleges. National Park College is in the Ouachitas, and Arkansas State University-Mountain Home is in the Ozarks–two mountain ranges, both in the state that’s now my home. When I visited Arkansas as a kid looking at colleges, I felt drawn here. The fun, kind people at these two campuses in such beautiful places remind me why I stayed. Now I will have a lull in book events as my attention turns to the Arkansas Community College annual conference. This year’s theme, Mission Possible. Meanwhile, to tempt you to pick up a copy of Underwater Panther, I’m sharing links to five poems in the book from the places where they were first published. And with the first poem listed, I’ll tell you a story. Amy Baldwin and I used to teach at a community college together. Near the end of her World Lit class, her students analyzed recently published poems based on the characteristics of the different periods of literature. What in this poem demonstrates Romanticism? Realism? etc. Great assignment. The poem that she used of mine was “Inheriting Pressure,” first published in Crab Orchard Review. When I got the comments back from Amy’s class with subsequent discussion, it was like I was seeing the poem for the first time. Suddenly this poem set the entire pattern for the book that followed. I was born and raised in southern Illinois. I live in Arkansas now. But it doesn’t matter where you come from. This poem and the book that developed from it are about what we inherit from a place without even knowing. This entry was posted in publications, readings and tagged ASU-Mountain Home, community college, Crab Orchard Review, Dos Passos Review, National Park College, poetry, The Boiler on October 7, 2015 by Angie Macri. 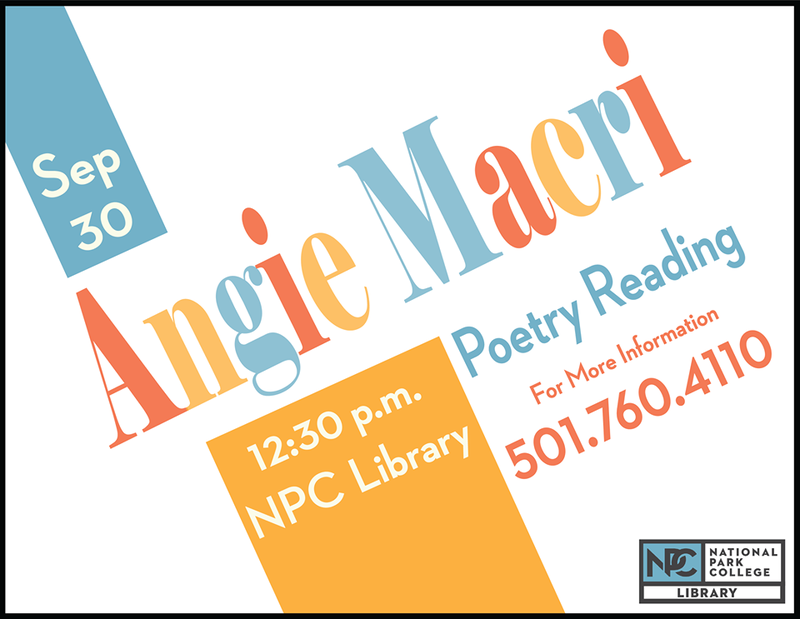 This entry was posted in readings and tagged National Park College, poetry on July 30, 2015 by Angie Macri.